Hindu Dharma - Any Use Talking? Samskaras such as marriage are akin to making chillies less hot by tempering them with ghee: they serve to tame the natural urges. We add ghee to the chilli so that it does not inflame the intestines. Carnal pleasure and worldly enjoyment are part of life of a householder but they are kept within certain limits so that he is not overcome by them. For a woman a life of chastity and loyalty to her husband, together with the care of the household, constitutes a samskara that is equivalent to all samskaras prescribed for her husband put together. All of us must recognise this fact. The goal of this nation is Atmic well- being. We must all pray with a pure heart to Isvara that we remain true to this goal. As we pray, we must have also faith in the Lord's grace. If we keep speaking about the ideals of marriage and womanhood, one day perhaps people will see the light. As things stand now, I am afraid that one day our people will be pushed to the wall. That will be the time when they will realise how they brought disaster upon themselves. When they have such an awakening they will recognise the need to find a way out of their predicament. That is why I keep speaking about the path shown by the sastras. "What purpose is served today by speaking about varnasrama, child marriage and so on? "This is a natural question." This is a natural question. " Three- quarters of it is all gone. Many aspects of our life are governed by the laws of the state and these are contrary to the ordinances of the sastras". This is true. The laws are such as to have our hands tied. We are called a "secular state". It means, we are told, a state does not concern itself with the matters of religion. It further mans that the government can interfere only in social matters and not in religious affairs. But ours is a religion in which all aspects of life, individual and social, are woven together. So the laws enacted by the state to govern social life have an impact on our religion too. Our rulers do not recognise or accept this fact. They limit their view of religion to certain matters and think that all else belongs to the social sphere and are the concern of the government. All religions contain features that relate to the social life of their followers. Does the government interfere with them as it does with the social foundations of Hinduism? No. It is this fact that causes pain. Though our rulers swear by the principle of secularism, they do not apply the same standard or yardstick to all religions. The minorities rise in protest against measures affecting their religious life introduced by the government. " These are against the Qu'ran", the cry is raised. Or, if the people affected are Christians, they say: "These are not in keeping with Christian doctrines". Yielding to such pressure, the government exempts the minorities concerned from the scope of the measures. In spite of its claim to being secular, the government thinks it fit to interfere with anything that has to do with the Hindu traditions. Representatives of the minority communities come forward to speak in protest against acts of interference. But what about the Hindus? Even if a couple of Hindus speak up they are dubbed "reactionaries" or "obscurantists" and the government goes ahead with its measures or laws brushing them aside. Our rulers often proclaim that "a secular state means a state that does not concern itself with any religion, that it does not mean that the government is opposed to religion as such, and that the prosperity of all religions is acceptable to the state"., But in actual practice what do we see? The government's actions are not opposed to any religion barring Hinduism. The Hindu religion has become a no-man's land. You will wonder why I am harping all the time on sastric matters fully aware though I am of what is happening in the country. My answer is that, whatever the present situation be, we cannot foresee how things will take shape in the future. In the previous generation we thought dollars grew in the American soil and that people there were not wanting in anything. But what is the situation there today? We now know that no other people experience the same lack, the same emptiness, in their lives as do the Americans. It is only after reaching the heights of worldly pleasure that the realisation has dawned on them that the very pursuit of pleasure has created a void in their lives, an emptiness in the very Self. They realise that, floating as they did in a sea of dollars, they were drawn to all kinds of evil like drinking, loot, murder and prostitution. Now as they have no peace of mind they come to our country in large numbers seeking peace in our yoga, in our philosophy and in our devotional music. We learn from this that what seemed good two or three generations ago is now seen to be evil. When people realise this they go in quest of liberation. The government, however well intentioned it be, has introduced measures that are against the sastras, thinking that they are good. But some day in the future people will realise that they are harmful. Even today we see signs of such realisation on the part of people here and there. There is a saying: "In the beginning it looked good. It was like a colt but as the days passed. Well, it was seen in its true form". The same could be said about some of the reforms introduced by the government, reforms contrary to the sastras. They look fine now but eventually we will realise that they will lead to a hopeless situation in society. Bhagvan speaks of two types of happiness in the Gita. "Yad tad agre visamiva, pariname' mrtopamam." Here the first type is described. This type of happiness is like poison in the beginning but like ambrosia, amrta, in the end. It is the sattvika or the highest type of happiness, like"halahala", the terrible poison, emerging first and amrta coming up later. 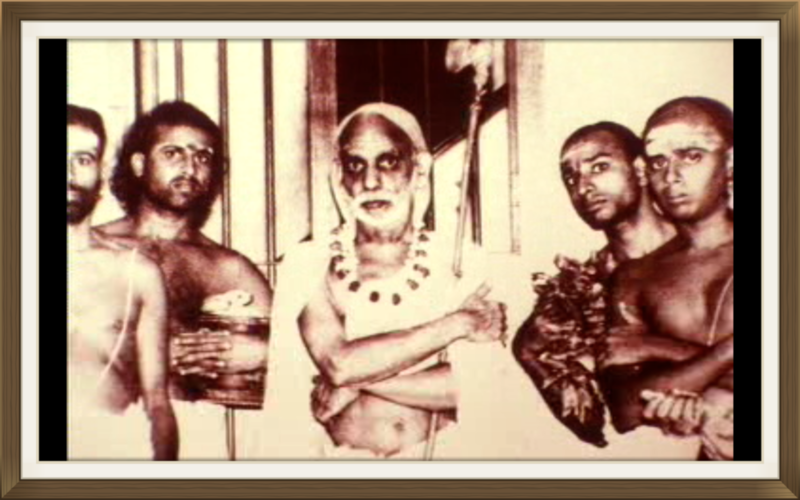 The sastras may now seem to be bitter like poison because of the discipline they impose on the individual, the family and society, but in due course they will be seen to be sweet. Now all bonds, all shackles will break and the incomparable bliss of Atmic freedom will be experienced. Here the poison is tasted momentarily but the amrta will be everlasting. "Yad tad agre' mrtopamam pariname visamiva", here the second type of happiness is referred to. In the beginning this type of happiness will taste sweet like ambrosia but, with the passage of time, it will turn bitter like poison. In America the dollar once tasted sweet like nectar but later turned bitter like poison. In India too, the reforms that are contrary to the sastras "taste" good now but they will be found to be poison in the times to come, when both the individual and society will suffer in the absence of contentment as well as discipline. People will then seek the amrta. Should they not know where they can find it? But by then the poison will have gone to their head and they will be in danger. So it is our duty to tell them where they can find the amrta. It is for them, for future generations, that we must keep speaking about the sastras instead of burying them deep in the earth. Even though we ourselves do not imbibe the sastric nectar today we must preserve the sastras to help future generations when they will have become spiritually weak because of the poison going to their head. This lamp of the sastras should show the way at least in the times to come. Nothing can be done now because I have my hands tied. But if I keep speaking to you unceasingly about the sastras it is because I am not yet gagged.